So, starting this blog has made me pay more attention to my sleep patterns, which I have pretty much brushed off up until this point. I’ve decided that a further investigation of sleep aids, and maybe even a sleep study, is needed. I will call this time period “My Search For Slumber”. I am teacher, so initially I was thinking it would make sense that summer would be the ultimate time to test different sleep aids, since I’d have the benefit of not having to work the next morning. This seemed pretty important, in case I woke up feeling like a zombie, like I did when I tried taking Nyquil. At least over the summer, me being groggy or snarky or loopy, won’t be putting today’s youth at risk. But, after a bit of thought, and some prompting from my cousin, Maggie, it occurred to me that I am often zombie-like, snarky or loopy, anyway. In fact, my husband often asks me constructive questions such as, “Are you EVER in a good mood?” To which I huff and roll my eyes. But, I do recognize that I am often NOT in a good mood. I’m exhausted. I don’t have the energy to get everything done around the house. Or to even do something that might be considered fun, like getting dressed up and going on a girls night out. In a vain attempt to get someone else (Husband) to cheer me up, maybe I do complain too much. And, maybe that isn’t fair, to ask of him. It also never works, so I don’t know why I keep trying that route. I’m ok at putting on a façade of normalcy when I am at work. But, that takes a lot of energy, and quite often after the work day is over, I want to collapse into a heap on the floor. Sometimes, this is exactly what I do. This isn’t to say that I am never actually in a good mood. In fact, I’d say that I AM cheery and chipper, between 30-50% the time. But, on those days, I am almost manic. Hyper. Energetic. Excessively talkative. In one 24 hour period I jog, scrub the sinks and organize my closet. I get ahead on my paperwork. I scrapbook, I sew blankets, make homemade cards, design road rallys, and create elaborate themes for parties, I cut out pages within old books to create secret cavities for hiding secret objects. On these days, I am productive as hell. I am on top of the world! If only I could harness this energy and feel like this every day. (Sidebar: I have an irrational fear that someone will make me accidentally try heroin or meth and I will LOVE IT and feel like this every day, and I will become an addict, my face will turn skeletal and I will develop oozing sores all over my body, my husband will divorce me and I will die a pitiful, homeless, wreck. The horror!) If I see my sisters on days like this, they will ogle me and ask if I am okay. One of them in particular usually tries to make me tone it down, but of course I simply mock her for reprimanding me. This lasts for a period of days to weeks, and then I crash back down to reality. I usually land on my face. It hurts. So, you might think that I possibly need to test out some other medications, than just the sleep aids. And you are probably right. However, I’m not ready to go there, quite yet (In anticipation of when that occurs, I have already named that time period, “My Search for Sanity”.) For now, I’m hoping that helping improve the quality of my sleep will result in a better quality of life when awake. How could it not? So, my first test began last night. My cousin Maggie recently went on a trip to France. She, too, experiences some difficulty sleeping, so while there she discovered a French sleep aid that she refers to as, My Pretty. In a fantastic blog about her trip, she referenced the benefits of My Pretty several times and brought home several boxes with her. I like to imagine her scouring neighborhoods for any drug store within a 40 mile radius (or should I say 65 kilometer radius) and buying each and every one of them out of My Pretty. I picture her purchasing an extra duffel bag for the sole purpose of bringing as many My Pretties home as possible, her throwing out the boxes to save room for the good stuff, the case stuffed to the brim with pills, and perhaps a few chocolate croissants or baguettes shoved in for good measure. But, maybe this is just what I would do. She generously sent me a sample of My Pretty, and has been hounding me to try them. She sent me the informational pamphlet along with the pills, but of course it is in French. So, I have no idea what chemicals abound within the little square tablet. Could be carcinogens, neurotoxins, Anthrax. But, it could still be worth it. My Pretties, French Pamphlet. 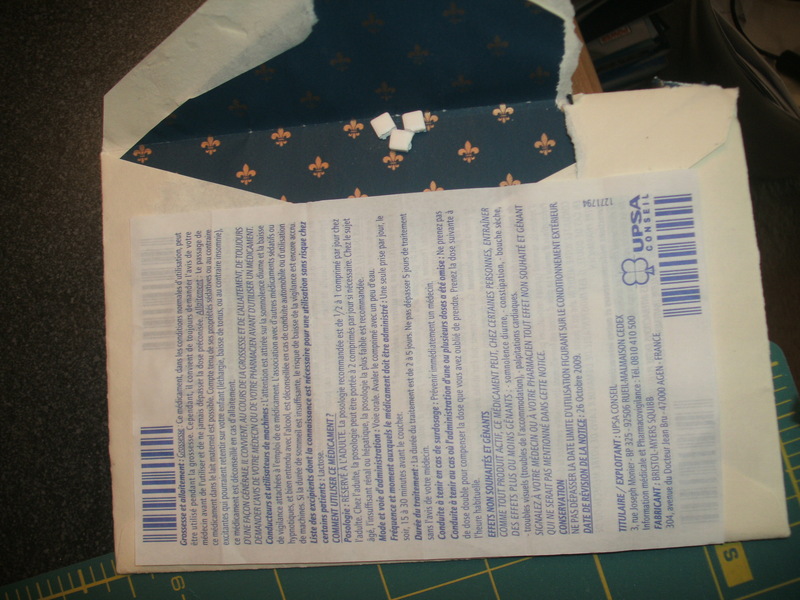 Note how I greedily tore open the fleur-de-lis envelope, knowing what awaited me inside. So, I began My Search for Slumber last night and popped of the My Pretties down my throat before bed. I always read each night before going to sleep, and after about ½ hour I did notice my eyes getting particularly heavy. GOOD SIGN, since generally I start becoming MORE awake after about 8 pm or so. So, I was hopeful. I woke up 4 times, which is the typical amount of wakeups I generally experience. But, normally upon these wakeups I feel AWFUL. EXHAUSTED and angry about the fact that I am awake. Last night when I awoke, I didn’t feel so bad. So, other than the time I got up to pee (which occurs at minimum once per night), I just went back to sleep. I woke up okay. Not too tired. Could it be? Could it actually be helpful? Suddenly I am referring to this French tablet as, My Precious. I picture myself becoming hunch-backed, losing my hair, eyeballs starting to consume my entire face. I see myself ready to maim anyone who might try to take My Precious away from me. We’ll see if My Pretty really becomes My Precious. I would happily turn into Gollum, if it meant success in My Search for Slumber. But if you turned into Gollum, wouldn’t that be the equivalent of your Meth Nightmare?? I’d look for a way to translate some of that French before I just began popping those things like TicTacs. Don’t get me wrong, I’m ALL about sleep but I like my drugs in English. I’m funny like that…. Well, I’m not looking for perfection so Gollum > Meth Addict. And, normally I’m with you on the language barrier…but I’m getting desperate. Plus, Maggie was already the guinea pig. A sleep study seems like it would right up your (scientific) alley. Looking forward to hearing about your more restful nights, in the days/weeks ahead. Why is it that the products which seem to work for us are always the ones we can’t ever find with ease? It’s infuriating. Perhaps you can get hooked up with a French drug store that’ll send you boxes of this stuff. Hopefully it works for you. But you’ve still got to do something about this waking up four times a night…. Baby steps, Laura. Baby steps. The difference between a well rested person and a tired one is huge. I had bad breathing problems and allergies at night for the last couple of years. Finally got some relief from the doctor and am doing so much more work and my mood is better. I hear you on being a Nyquil zombie. That stuff is strong. Right?! I wonder if I’m actually a NICE, CALM person…. probably not, but a girl can imagine, can’t she? What did you get to get some relief?? I did find Singulair really prevents me waking up from coughing at night from asthma.